BK Ventspils (LatEstBL) signed 24-year old American (has also Guinean passport) power forward Ousmane Drame (206-102kg-93, college: Quinnipiac). He played last season at Westchester Knicks (NBA G League) in the U.S. In 5 games he had 3.0ppg and 2.2rpg. Drame also spent pre-season at Ironi Nahariya (Winner League) in league where in 5 games he recorded 6.4ppg, 3.4rpg and 1.0bpg. His team made it to the Israeli Winner final. Drame was voted All-MAAC Defensive Player of the Year back in 2015 at his college time. 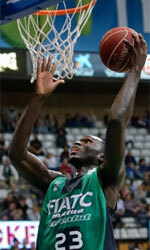 Drame has played previously professionally in Spain (Joventut) and Turkey (Samsun). He attended Quinnipiac College until 2015 and it will be his fourth season as a professional player. Zeus Energy Group Rieti (Serie A2) signed experienced 34-year old American (has also Guinean passport) forward Robert Jones (201-98kg-84, college: Washington). He will still stay in Italy where he played last season at Pompea Mantova. In 30 Serie A2 games in Italy he had 13.3ppg, 7.7rpg and 1.3apg. Good season as he was named League Player of the Week. The previous (16-17) season Jones played at UCC Piacenza (Serie A). In 19 games he recorded 14.4ppg, 9.0rpg, 1.8apg and 1.1spg. In 2006 Jones was drafted by Minnesota Timberwolves (NBA) in second round (37th overall). The former University of Washington staris in his 13th (hopefully lucky) season in pro basketball. The list of the past achievements is quite long as among others Jones was voted Eurobasket.com All-Italian Serie A2 Honorable Mention in 2017. He is quite experienced player. Jones has played in five different countries on three different continents (Europe, Latin America and of course North America). He has played previously professionally in Dominican Rep., Puerto Rico (Brujos), NBA G League (Sioux Falls Skyforce), Italy (Virtus Roma, Deco, BancaTercas and Sutor Montegranaro) and Dominican Republic (Titanes Licey). Jones could be described: Good perimeter defender. He is a stellar defensive player, a good athlete and an unselfish team guy. He is the model of the type of player in terms of his unselfish team attitude and mental toughness. 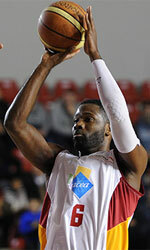 Morges-Saint-Prex BBC (NLB) landed 26-year old Guinean international power forward Mohamed Souare (200-95kg-92). He played most recently at Fribourg Olympic (SBL). SBL was a little too high level for him, where in 16 games he averaged just 1.0ppg and 1.4rpg last season. NLB will be definitely a better match and he can see more playing time. Souare helped them to win the league title and the cup. Part of previous (2016-17) season he spent at Meyrin Basket (LNB). In 7 games he had 8.4ppg, 6.1rpg, 1.3apg and 1.3spg. Souare also played for BC Winterthur (LNA). In 5 games he recorded 3.0ppg, 2.8rpg and 1.6spg. He represented Guinea at the Afrobasket Championships last year. His stats at that event were 3 games: 6.0ppg, 3.0rpg, 1.0apg, FGP: 55.6%, 3PT: 25.0%, FT: 83.3%. Souare has played previously for Swiss team Chene.